Windows 3.1 Developement SDK - How to make a program? I wanted to make a program in Windows 3.1 for keks, so I got the Windows 3.1 Developement SDK. I then installed it, and in autoexec.bat I set my path variable to "C:\DOS;C:\WINDOWS;C:\WINDEV\BIN;C:\WINDEV\INCLUDE;C:\WINDEV\HELP". I copied all of the contents of C:\WINDEV\INCLUDE to C:\WINDEV\BIN and C:\WINDEV\GUIDE\OUTPUT to try silence the "windows.h - file doesn't exist" error or whatever, and it worked! I did silence it! 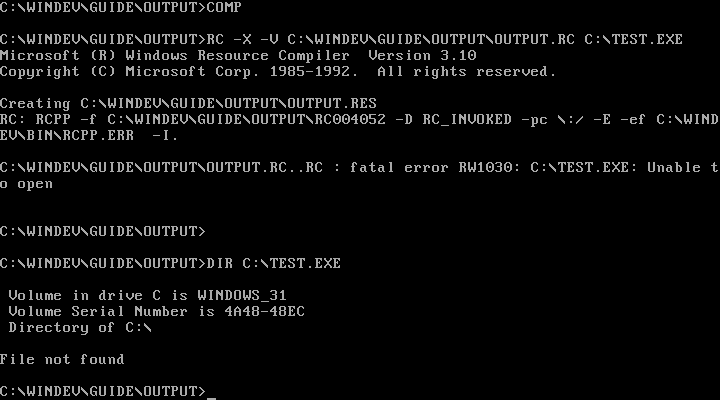 However, it gives me an IO error when trying to compile the OUTPUT.RC into an exe. 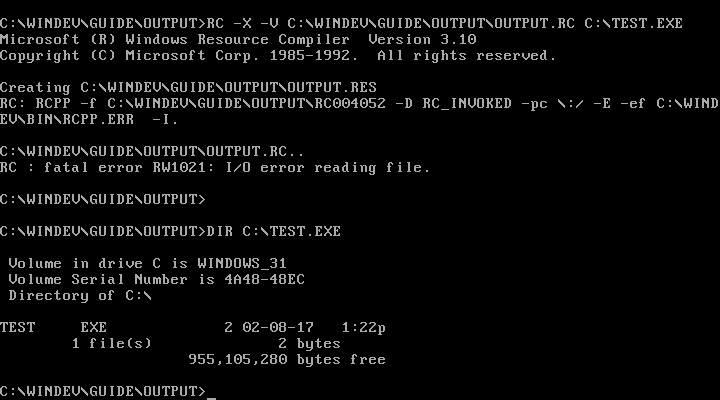 I have "COMP.BAT" setup to do "RC -X -V C:\WINDEV\GUIDE\OUTPUT\OUTPUT.RC C:\TEST.EXE"
I have verified that C:\TEST.EXE exists, but compiling without it existing and with it existing both fail. The RC program needs the EXE file to exist already. I'm assuming your EXE is malformed as it is only 2 bytes long. Maybe double check for problems in your linker command that produced the EXE? Note that the SDK \GUIDE\OUTPUT directory includes a Makefile that you can use with NMAKE (included, for instance, with MS Visual C++), so that you can just run NMAKE with no parameters and it will do all the steps including the RC run.